Our answers to the most frequently asked questions are below. 1.1.	Who do I contact with queries? As the firm responsible for all application processing and portfolio management, TAM Asset Management Ltd (www.tamassetmanagement.com) is your point of contact for queries in these areas. Greenfinch is purely acting in the role of introducer to this non-advised and entirely self-selected TAM investment platform service. 1.2. How do I contact TAM Asset Management? TAM can be contacted at hello@tamassetmanagement.com or alternatively please call TAM on: +44 (0)207 549 7705 (Monday to Friday 9am – 5pm). 1.3. Is TAM Asset Management regulated? 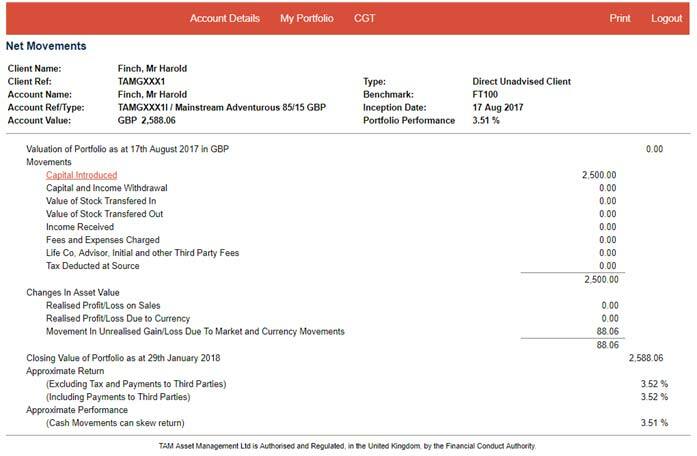 TAM Asset Management Ltd is authorised and regulated by the Financial Conduct Authority (FCA) No. 208243. 1.4. Does selecting a portfolio using the TAM platform include any financial or investment advice? The Platform only provides information about and access to the range of discretionary managed investment portfolios offered and managed by TAM. This information and access to TAM’s services is provided on a non-advised basis. TAM makes no representation to you as to the suitability of nor does it advise on the merits of the discretionary asset management service it provides and TAM makes absolutely no warranty as to the suitability of TAM’s services or of a particular portfolio for you. You should take independent advice and consult an independent financial adviser or other professional adviser if you are unsure about whether TAM’s model portfolio services are appropriate for you. We have not undertaken a fact-finding questionnaire and consequently we have no knowledge of your personal circumstances or financial situation. 1.5. Where are the terms and conditions? For more detail please review the full Terms and Conditions here. 1.6.	Who is TAM Asset Management? TAM Asset Management Ltd is an award-winning discretionary investment manager with company roots tracing back to the 1930s. TAM's experienced team of investment professionals believe that all investors should have easy access to actively managed, diversified and transparent investment portfolios, regardless of their level of wealth. 1.7. What is a Discretionary Investment Manager (DIM)? A DIM is a specialist investment manager that you authorise to manage your investment portfolio and make investment decisions on your behalf. A DIM will make investment decisions without your prior approval or consultation, and by selecting your chosen portfolio, you give explicit instruction to TAM to manage your money in line with that profile. 1.8. What are the characteristics of this service that cumulatively make it unique? 2.1. How secure is my money? TAM is a member of the Financial Services Compensation Scheme (FSCS) and you may be entitled to compensation for any losses, up to £50,000, in the unlikely event of TAM being declared in default or going into liquidation. The security of your investment is paramount, which is why TAM Asset Management do not seek to hold client money or assets directly. Instead, your investments are held with TAM’s custodian, Pershing Securities Limited (Pershing), who look after over 600,000 clients with assets of over US$1 trillion. They are part of The Bank of New York Mellon Corporation (BNY Mellon), one of the world’s largest and strongest financial institutions who offer some of the highest levels of protection available in the industry. 2.2. I received Quarterly Valuation and Custody Statements from TAM and TAM’s custodian -Pershing, what do I need to do? You will receive quarterly valuation and custody statements from TAM and Pershing (TAM’s custodian) respectively. You don’t have to do anything with these. They are sent to you for your information and to keep on record. 3.1. How do you ensure my account remains secure? TAM does not store any of your access, account or personal detail online. Any time a request is made via the online web portal to amend any detail relating to your account, you will receive a text to the mobile phone number you have provided. If you have not made any changes yourself you should contact TAM immediately via phone on +44 (0)207 549 7705. No action is taken to amend your account in any way from a simple change of email address to a request for a withdrawal without manual checks by TAM. Therefore, if you receive a text notifying you of changes to your account that you do not recognise out of UK office hours, you should still call the above number and leave a message. TAM will then contact you at 9am next day before any amends are made. This acts as a failsafe to ensure the security of your account. 4.1. How do I set up an account? Review the educational pages accessed via the Greenfinch site here. If you determine an investment account is right for you, then choose from one of the eight fully managed investment portfolios. Decide if you want to participate in the charitable giving options provided, donating to your favourite cause, with TAM matching your donation via You Give We Give (for more details of this, see section 10 below). Send TAM your monies via cheque or bank transfer. Once your account is funded, you will be able log in to your online profile and see every aspect of your portfolio, from anywhere, at any time, on any device. 4.2. I’ve chosen my portfolio and set up my account, what happens next? You will receive a welcome email confirming the details of your new TAM investment portfolio and a reminder of how to fund your account. If for any reason you have not received this, please contact TAM. Once you have funded your account, TAM will invest your monies as quickly as possible and let you know when you are able to log in to your online profile and see your new investments working for you. 4.3. I’ve changed my mind and no longer not wish to invest in a TAM portfolio – what do I do? If you change your mind before you receive confirmation from TAM that your funds have been invested, contact TAM to arrange return of your cash before your account is created. If you have received confirmation that your account has been opened, follow the instructions detailed in section 14.2 below. 4.4. How much is the minimum investment? You can invest with as little as £100 and there is no maximum investment. 4.5. How do I fund my account? This can be done via cheque or bank transfer. Ensure you write your name and the unique reference number received in the account opening process on the back of the cheque. If you have misplaced the account opening email with the reference number then please contact TAM on: +44 (0)207 549 7705 to re-request the reference number. Reference: The unique reference number received in the account opening process. If you have misplaced the account opening email with the reference number then please contact TAM on: +44 (0)207 549 7705 to re-request the reference number. 4.6. Can I make regular contributions to my investment? 4.7. What documentation will I receive on my investment portfolio? The majority of communications you will receive will be online via email from your appointed investment manager, TAM Asset Management Ltd. TAM and TAM’s custodian – Pershing Securities Limited (‘Pershing’) will send quarterly valuations and custody statements to the address specified when you opened your account (or as subsequently amended by you). Instructions on how to use the Investor Portal are contained below. 4.8. I’ve submitted an application but cannot log in to view my investment, what do I do? Submitted applications are processed by TAM Asset Management Ltd (TAM) within 2 working days. TAM will be in touch to let you know that your application has been approved and again when they have received your funds. Only once your account is funded will your online account be set up – please allow up to 2 working days from receipt of this email before you try and log in from the website where you completed your application. If you still cannot log in after this time, please get in touch with TAM. 5.1. Can I withdraw my money at any time? Yes you can. It can take up to ten working days to receive your money after a liquidation or withdrawal request has been processed, although we aim to complete such requests in five days. However, in the case of some less liquid asset classes (such as property funds) this may at times take longer. This will normally be for reasons beyond our control, such as a manager temporarily suspending the trading of a fund. Typically, investment in less liquid funds only represents a relatively small part of our overall portfolios and whilst suspension of such funds is rare, you may not always be able to liquidate these holdings as quickly as you would be expect. To complete a withdrawal request, please follow the instructions detailed in section 15.2 below. 6.1. What type of account can I open? You can open a general investment account (GIA) for as little as £100 with no maximum investment, or you can open a tax efficient individual savings account (ISA) where you can invest up to £20,000, for the tax year 2017/2018. 6.2. Can I open more than one account? TAM can currently only accept applications for one account per person at the moment – a GIA or an ISA. TAM will advise by email when this changes. 6.3. Can I use the service if I am not a UK resident? TAM currently only offer these services to UK residents but may add further countries and jurisdictions in the future. 6.4. What is a general investment account (GIA)? A general investment account (GIA) is an account for your general monies which can be opened with as little as £100 and is not subject to any restrictions on limits unlike an ISA. Your money can be accessed at any time but as investing should be seen as something to undertake for the longer term, in order to give you the best chance of riding out short term fluctuations, it is always worth retaining some cash at the bank for those unforeseen little emergencies. Any gains taken within this type of account may attract Capital Gains Tax if those profits are above the HMRC annual exempt amount. Currently that limit sits at £11,300 for the tax year. 6.5. What is an individual savings account (ISA)? An ISA is an account where gains can be taken free of tax. Because of this benefit there is an annual limit on the amount you can invest. For the 2017/2018 tax year this limit is £20,000. With an ISA you can withdraw your money at any time but you need to be careful to ensure you do not lose your ISA allowance on money withdrawn. 6.6. Can I transfer my existing ISA to the service? Currently TAM only offer ISAs for new subscriptions. TAM are developing the systems to allow the acceptance of transfers from your existing provider and will advise by email if this becomes available. 6.7. Is there a cash ISA option? No - only a stocks and shares ISA. 6.8. Do you offer a junior ISA? No, not yet. TAM will advise by email if this becomes available. 6.9. Is there a pension option? No, not yet. TAM will advise by email when a non-advised self-invested personal pension (SIPP) becomes available. 6.10. Is there a joint account option? Unfortunately this isn’t a service currently offered but may be developed in the future. 6.11. Can I invest ethically with TAM? Yes you can, but remember people’s ideas of ‘ethical’ can differ. TAM offer a range of investment portfolios containing funds that market themselves as either ethical, social, environmental or sustainable. Some funds assess themselves as ethical based on their inclusion of specific companies, whereas some may consider themselves as ethical based on their exclusion of specific companies. 7.1. What does it cost to use the service? The annual fee is just 0.65% plus VAT per year to manage your portfolio and help you work towards your investment objectives. As with any service of this type, the underlying funds within a portfolio each carry an average annual cost know as a Total Expense Ratio (TER). 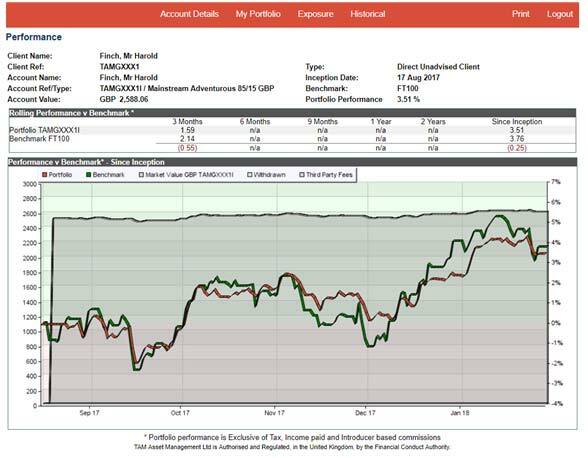 For our mainstream portfolios this TER is between 0.37% and 0.53%, for our ethical portfolios this is between 0.46% and 0.62%. The TER is dependent upon the portfolio type and composition of the underlying investments, and may fluctuate over time. 7.2. How do I pay the fees? You don’t need to do anything. TAM will automatically deduct all fees from your portfolio on a monthly basis, and you can view all transactions by logging in to your online account, whenever, wherever, on whatever device. 7.3. Are there any other charges? TAM do not charge any admin fees, but if you would like to withdraw some or all of your funds at any point, or if you cancel your account and subsequently your funds need to be returned to you, standard bank charges will apply. Our default payment method is via BACS at £10 per transaction and should take 3 working days to clear in your account. Same day payment can be requested and completed via CHAPS, costing £25 per transaction. 8.1. How is my money invested? Your monies are invested in line with the style of investments and equity / non-equity split you have chosen for your portfolio. TAM only invests in regulated and/or listed funds. Where possible, they will invest in the institutional share classes. Your investment can go down as well as up and you may get back less than your original investment. 8.2. How quickly will my money be invested? Your money will usually be invested as soon as the funds have cleared within TAM’s bank. Bank transfers are usually received within 24 hours and it usually takes up to 10 working days for a cheque to clear. 8.3. What sort of return can my investments get? TAM can never guarantee a particular return because past performance is not a guide for future gains. However the online application tool provides TAM’s multi-year track record and an illustration of the potential return for the portfolio you select during your application process. Please always bear in mind that investments don’t always go up and you could get back less than you invested. 8.4. How can I review my investments? See the instructions in Section 13 “Keeping Track Of Your Account” below. You can review your investment 24/7, all at the click of a button. TAM’s innovative online platform offers 24 hour access and complete reporting transparency for clients. It allows up to date portfolio valuations, and detailed analysis of investments, performance measurement and details of asset exposure. With a few clicks it is possible to draw a full management report of your chosen dates and style, which can be delivered as a .pdf ﬁle instantly. 9.1. What investment portfolios do you offer? 10.1. Are there risks involved in investing? There is always an element of risk when investing as the value of investments can go down as well as up and you could end up with less than you originally invested. You may wish to consider certain aspects of your individual circumstances before you invest, such as your knowledge and experience of investing, retirement planning, affordability and savings. You may also wish to consider the risks associated with the various types of investments our managers may invest in before proceeding. You can find out more about this in the risk section of the Terms and Conditions. 11.1. What are my charitable giving options? The award nominated You Give We Give scheme - pledge a donation of a % of your investment profits to your chosen charity when opening your account. TAM will match the % you choose by donating the same % of its management fee. If you make no gain, you make no donation. TAM will nevertheless donate the selected percentage from their management fee. Donate 0.5% of your initial investment. 11.2. How are donations made? During the application process, simply nominate the charity you would like to benefit and select You Give We Give and/or a 0.5% donation. 11.3. How are annual You Give We Give donations taken care of? You can donate up to 20% of your investment profits every year. TAM will manage all donations on an annual basis. TAM will email you each year outlining clearly the calculation, the payment and confirmation of the donation to your chosen charity, what they will receive. Should you be happy for TAM to provide the charity with your details and you are a UK taxpayer, the charity will also be able boost your donation by 20% via the HMRC Gift Aid scheme, at no extra cost to you. All you will need to do is fill in the online gift aid form and authorise TAM to pass this on to the charity. Your chosen charity will receive confirmation of your details so they are able to claim Gift Aid, providing you authorised us to do this during the account opening process. 11.4. Who can I donate to? You can donate to any UK registered charity of your choice. If you do not currently support a charity but would still like to donate, we have partnered with a number of very worthy causes for you to choose from. 11.5.	Who are the YGWG Charity Partners? TAM work with a wide variety of charities across the UK who beneﬁt from the scheme and together, they are continuously think of fresh and exciting ways to raise the proﬁle of the initiative, engage supporters and raise vital funds for inspiring causes. More information on TAM’s partner charities can be found here. 12.1. What do I do if I have a complaint? Your Personal Data will only be shared between TAM, Pershing (TAM’s custodian) and the platform Introducer you came through. Your details will not be shared with any other 3rd parties. Your explicit consent allowing TAM and Greenfinch to bring to your attention additional services is provided as part of the application process. However you may provide us with written notice to revoke this permission at any time by email to hello@tamassetmanagement.com. More detail on usage of your data for the purposes of managing your account is available in the Terms and Conditions in Section “Part 19 Data Protection and Fair Processing”. 13.2. Do you run a credit check on me? No, we don’t run a formal credit check. We use credit reference agencies to verify your details and this leaves a footprint on your profile, but it doesn’t affect your credit rating in the same way as a credit check. 14.1. How do I access my account? You will receive login instructions once your account has been opened and funded. You will have set your initial password as part of the application process. Your login access is from Greenfinch’s website. 14.2. What does the online web portal provide me in the way of info/reporting? TAM provides an online web portal which offers clients an extensive range of features to maximise the efficiency with which they can keep track of their investment portfolios. This includes a comprehensive overview of their investment portfolio detailing individual investments and performance, as well as the reasons behind each individual investment. Clients can also view a breakdown of the sector, geography and currency exposures within their portfolio, as well as a full portfolio valuation since inception. Investors are also able to produce a full investment review pdf within seconds, at any time of the day. 14.3. How do I get an immediate overview of my account? 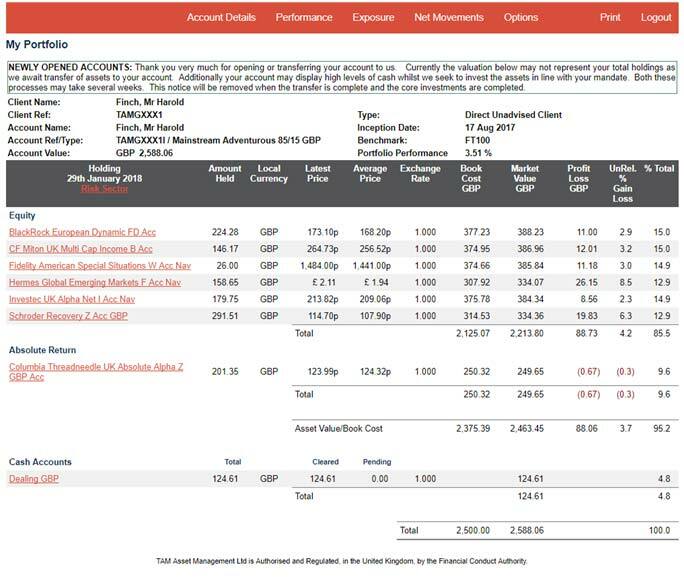 The initial “Account Detail” screen after login gives a basic summary of the account type, market value of the portfolio, monetary gain/loss and percentage gain/loss since inception. 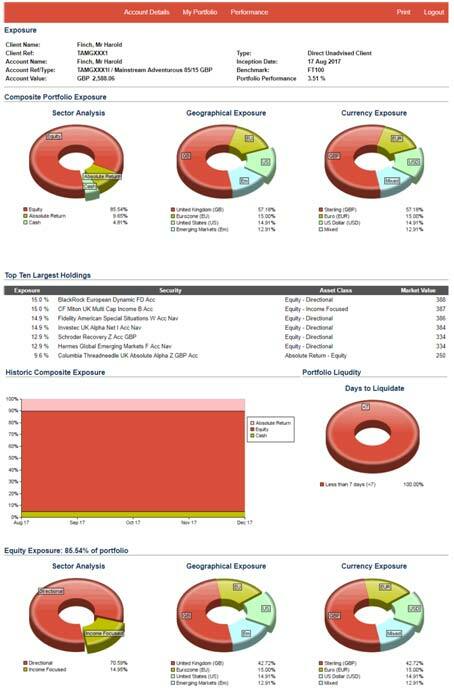 On this page, you will also see a breakdown of the portfolio’s exposures across sectors, geography and currency, as well as TAM’s latest Urgent Manager Commentaries, which report on the latest market news. 14.4. How do I view more detail on my account? 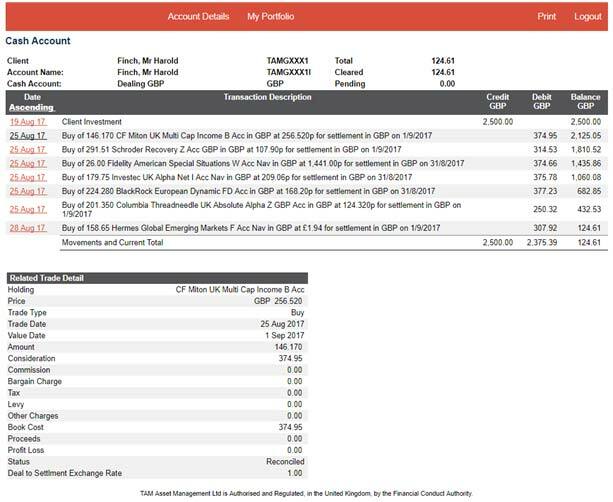 To view the full portfolio, in the “Account Detail” screen you need to click on the account reference – in the above screenshot example this is “TAMGXXX1” in red. The ‘My Portfolio’ page is a summary of all the positions held within your portfolio, including the amount held (in units and as a percentage of the overall portfolio), the monetary value of the holding and the profit or loss made on the position since its addition. The ‘My Portfolio’ tab will always appear in the top panel to return you to this page when you have navigated away. Illustration only. Past performance is not a guide for future returns. The value of investments, and the income from it, may go down as well as up and may fall below the amount initially invested. The ‘Net Movements’ option allows you to see a valuation of your portfolio as at the inception date. 14.5. How do I view my CGT position? Click on “Dealing GBP” at the bottom of the ‘My Portfolio’ page. The cash account shows dates and details of all cash movements into and out of the portfolio since inception including fees, purchases/sales of funds, withdrawals and dividends received. To see the Cash Transaction Narrative, simply select the date of the transaction and the narrative will appear at the bottom of the page. 14.6. How do I view all cash movements into and out of the portfolio since inception? 14.7. How do I get more information on the funds in my portfolio? 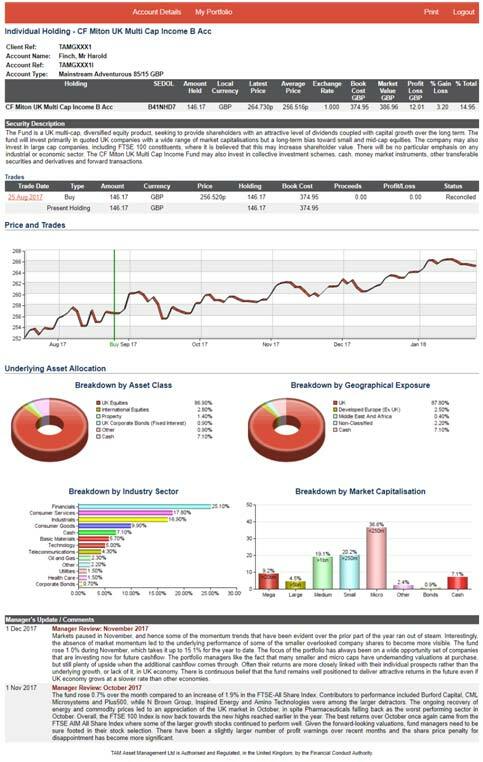 If you wish to look closer at an individual fund, just click on the fund name in the ‘My Portfolio’ page and you will be directed to a page which gives you a thorough overview, including a short description of the issuing company and security, a link to the KIID fund factsheet document, details of all the trades made on this specific fund starting with the initial purchase (displayed in the illustrative graphic below), a full breakdown of the underlying asset allocation of the fund and a list of commentaries from the Fund Manager (typically produced on a monthly basis). Selecting a trade date will direct you to a page which details the specifics of the trade, including a narrative written by a member of TAM’s investment team, outlining the reasons behind the trade. 14.8. How do I get more detail on the performance of my portfolio? Select ‘Performance’ at the top of the ‘My Portfolio’ page which will direct you to the page below. Here, you can see a table of the performance of the portfolio versus the benchmark, along with a graphic, with the shaded regions also showing the market value of the portfolio, withdrawals and fees. To see performance broken down on a month-by-month basis, select ‘Historical’ in top panel. You will then be able to analyse each individual month separately. 14.9. How do I get more detail on the asset allocation exposure of my portfolio? 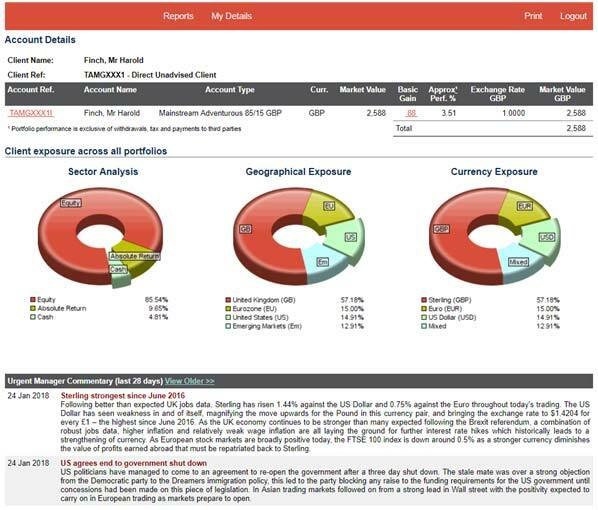 Select ‘Exposure’ tab which will take you to a page displaying the aggregated portfolio exposure by sector, geography and currency, the top ten largest holdings within the portfolio, historical exposure and exposure to each asset class also broken down by sector, geography and currency. 14.10. How can I generate a comprehensive pdf investment report? You are able to generate a comprehensive report within seconds by selecting ‘Reports’ on the initial ‘Account Details page. It is then simply a case of selecting ‘Report Request’ in the top panel of the following page, which will lead you to the page below, where various report types can be chosen from the drop down list and a date range can be selected as required. Select ‘Generate Report’ and you will see the automatically generated report appear on the generated reports page. This page will also have links to all other recently created reports. Click the underlined title of the report you wish to see and it will launch as a pdf. which can be downloaded and used as required. 15.1. How do I change my password/email/phone numbers/address? Click on “My Details” in the “Account Detail” and follow the instructions. 15.2. How do I change my portfolio and charitable giving selections, or close my account or withdraw funds? From the top level “Account Details” screen, select the account reference to access the ‘My Portfolio’ page. From this page select “Options”. Then follow the instructions. If you are invested in a general investment account (GIA) you may need to declare your capital gains each year for my tax return. 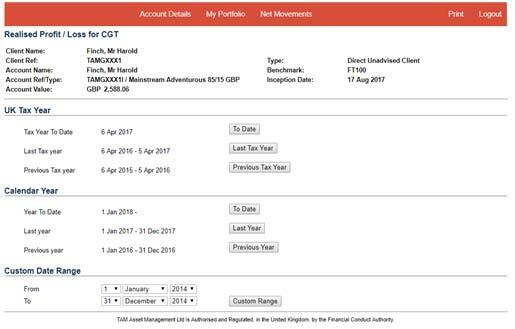 Your CGT statement will be made available in your online account at the end of every tax year. See the instructions in 14.5 above. 16.2. How do I obtain my annual consolidated tax voucher (CTV)*? Your annual CTV voucher will be emailed to you at the end of every tax year. If you do not wish to receive this, please just let us know. * TAM is not a tax adviser and makes no warranty as to the accuracy of the information displayed. If you need to, please seek independent tax and/or financial advice. Is Ethical Investing For You? 2019 © All Rights Reserved. Greenfinch is a trading name of FinchTech Ltd, an appointed representative of TAM Asset Management Ltd who are authorised and regulated by the Financial Conduct Authority No. 208243. Registered in England No. 04077709. Registered Office: 10th Floor, City Tower, 40 Basinghall Street, London, EC2V 5DE.